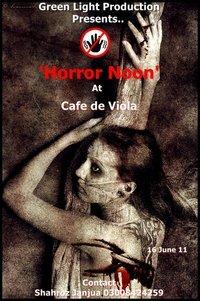 For the very 1st time we are introducing Horror Noon with a horror movie ending up with a dance party. because of huge response, We are only accepting reservations 2 avoid any embarrassment book in now. Dress HORROR and win FREE ENTRY! P.S: Stags are not allowed.